Keyboard mavens will appreciate the Finder search window shortcut key. Check out the Finder search window. To further filter the search, click one of the buttons on the search criteria bar to create your own custom filter. Click the button with the + (plus) on the search criteria bar and then click the pop-up menus to choose criteria, such as the type of file, the text content, or the location on your system (for example, your hard drive, your Home folder, or a network server). You can also filter your results listing by the date when the items were created or last saved. To add or delete criteria, click the + (plus) and – (minus) buttons at the right end of the search criteria bar. To save a custom filter that you’ve created, click the Save button. The spacious borders of the Finder search window. Images appear as thumbnail icons, so you can use that most sophisticated search tool — the human eye — to find the picture you’re looking for. (If you don’t see thumbnail images, click the Icon view button on the toolbar.) Don’t forget that you can increase or decrease the size of the icons by dragging the slider at the bottom right of the window. To display the contents of an item in the list (without leaving the comfortable confines of the Finder search window), click the item to select it, and press the spacebar for a better view. 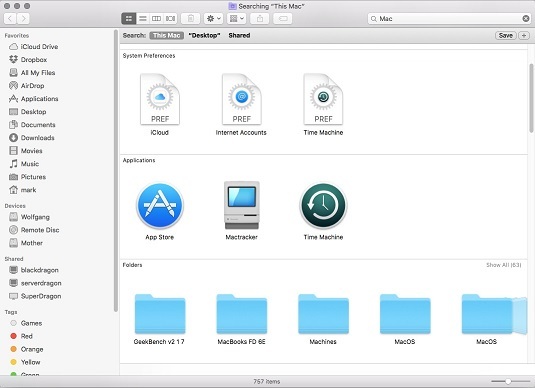 Note that El Capitan must recognize the format of the file, and it must be supported by at least one application. Again, when you’re ready to open an item, just double-click it in the Finder search window. On the Dock, click the System Preferences icon (the one with the gears). In the service list on the left side of the Sharing pane, select the On check box next to the File Sharing item to enable it. Click the Close button in the System Preferences window (or, if you’re a keyboard power user, simply press the ⌘+Q shortcut). You can search only those items that you have rights and permissions to view on the remote Mac (such as the contents of the Public folders on that computer).